The status and vitality of the Cherokee language, the Native American Indian Iroquoian language of the Cherokee people, is considered "definitely endangered" in Oklahoma and "severely endangered" in North Carolina according to UNESCO. The Cherokee language remains an integral part of the Cherokee history and cultural identity, and two out of three dialects currently survive. Cherokee has been the co-official language of the Cherokee Nation of Oklahoma alongside English since a piece of 1991 legislation[a] proclaimed this, which set a policy for the political branch of the nation to maintain Cherokee as a living language. Cherokee is also recognized as the official language of the United Keetoowah Band of Cherokee Indians. As Cherokee is official, the entire constitution of the United Keetoowah Band is available in both English and Cherokee, and tribal members may communicate with the government in Cherokee or English. 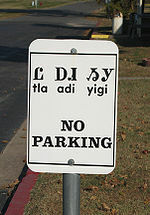 English translation services are provided for Cherokee speakers, and both Cherokee and English are used when the tribe provides services, resources, and information to tribal members or when communicating with the tribal council. Because they are within the Cherokee Nation tribal jurisdiction area, hospitals and health centers such as the Three Rivers Health Center in Muscogee, Oklahoma provide Cherokee language translation services. The Cherokee Nation sponsors a language preservation project, offering online classes for Cherokee language levels I, II, and III. Participants can test their knowledge of the language online at the Cherokee Learning Center, also sponsored by the Cherokee Nation. Classes for adults who do not yet speak the language are offered in many locations. On the national level, the federal election voter guide is now available in the four most commonly spoken Native American/Alaska Native languages, of which Cherokee is one. In August 2002, the Cherokee Nation conducted a language survey of 115,026 Cherokee citizens who live within the 14 counties of the Cherokee Nation in Oklahoma. In the home, Cherokee was only used by 17% of survey respondents; the overwhelming majority spoke only English in the home setting. 18% of the surveyed persons spoke Cherokee as a first language, and 5% had learned Cherokee and English jointly as primary languages. At the beginning of the 20th century, 75% of Cherokee citizens are believed to have been raised bilingually in Cherokee and English. Today, only about 5% or less are raised in Cherokee-speaking homes. Many speakers, perhaps the majority, are over fifty years of age. Another 2002 survey indicated that the Cherokee language was very close to extinction, as few people younger than the grandparental generation were found who were fluent in the language. Usually, older adults are the final speakers of a language. If they do not pass it along to their descendants, the language will be lost. Thus, the 2002 estimate for the lifespan of the language was only about 30–40 years. The Cherokee language in North Carolina was found to be particularly imperiled, with perhaps fewer than 1,000 remaining speakers[where?] and elderly speakers dying off far more quickly than new speakers were emerging. From such surveys the Cherokee Nation also learned that most of its members believed preservation of Cherokee culture and language for future generations is essential. A lesson at Kituwah Academy on the Qualla Boundary in North Carolina. The language immersion school, operated by the Eastern Band of Cherokee Indians, teaches the same curriculum as other primary schools, but the Cherokee language is the medium of instruction from pre-school on up and students learn it as a first language. Such schools have proven instrumental in the preservation and perpetuation of the Cherokee language. The Cherokee people stand at the forefront of language preservation. 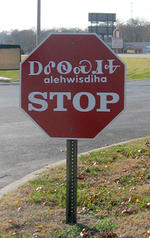 Upon learning that their traditional language was at risk, the Cherokee Nation instigated a 10-year language preservation plan that involved growing new fluent speakers from childhood on up through school immersion programs as well as a collaborative community effort to continue to use the language at home. This plan was part of an ambitious goal that in 50 years, 80% or more of the Cherokee people will be fluent in the language. The Cherokee Preservation Foundation has invested $3 million into opening schools, training teachers, and developing curricula for language education, as well as initiating community gatherings where the language can be actively used. Formed in 2006, the Kituwah Preservation & Education Program (KPEP) on the Qualla Boundary focuses on language immersion programs for children from birth to fifth grade, developing cultural resources for the general public and community language programs to foster the Cherokee language among adults. Section 16C-21 of the Cherokee Code provides for the structure and financing of the Kituwah Language Immersion Fund. Today, the school serves over 75 students ages seven months to seven years. An allotment of .60% of the total gaming revenue received by the Eastern Band of Cherokee Indians (EBCI) Tribal Government is placed aside for the Kituwah initiative. The purpose of this program is to improve the overall quality of life for Eastern Band of Cherokee members through increased fluency in Cherokee and cultural awareness by garnering community support, developing language programs and materials for all community members, as well as reestablishing a public life for the language in which Cherokee is commonly heard and spoken. Currently there are two total immersion programs; early childhood education and elementary education. Five preschool classrooms are dedicated to educating children ages two to five years old, which accounts for 24 students currently. In 2010 the New Kituwah Academy became independent of the Cherokee Central Schools of which it was a satellite the previous year. All students that attend the New Kituwah Academy are enrolled members of the EBCI. The school currently has a four-star license through the North Carolina Department of Child Development. Student who attend the school learn all the same curriculum material that students in other schools learn, the only difference is that the instruction at the New Kituwah Academy is in the Cherokee language. The elementary portion of the academy is guided by the North Carolina standard course of study and the No Child Left Behind Act. This is primarily accomplished by pairing teachers and fluent speakers within each classroom. Understanding the need to be bi-literate, and to score well on standardized testing, the academy teaches English language arts at the end of each school day. In 2008, to build on the success of the preschool immersion program, a new $7 million state of the art school was built in Cherokee to serve as the heart of language revitalization. Atse Kituwah has become the home of the language immersion programs as well as the community cultural and language activates. The building hold both immersion programs as well as providing community spaces, adult language classes, and serves as a language and cultural campus for the EBCI. There is also a Cherokee language immersion school in Tahlequah, Oklahoma that educates students from pre-school through eighth grade. Students actively speak the language, using it in all settings: on the playground, in the classroom, in sports  and in technology. At the school, posters showing countries, planets, parts of the body and the Pledge of Allegiance are all written in letters from the Cherokee syllabary. As of 2014, elderly monolingual Cherokee speakers are assisting in language preservation efforts and help the tribe develop education materials for the school. Because Oklahoma's official language is English, Cherokee immersion students are hindered when taking state-mandated tests because they have little competence in English. The Department of Education of Oklahoma said that in 2012 state tests: 11% of the school’s sixth-graders showed proficiency in math, and 25% showed proficiency in reading; 31% of the seventh-graders showed proficiency in math, and 87% showed proficiency in reading; 50% of the eighth-graders showed proficiency in math, and 78% showed proficiency in reading. The Oklahoma Department of Education listed the charter school as a Targeted Intervention school, meaning the school was identified as a low-performing school but has not so that it was a Priority School. Ultimately, the school made a C, or a 2.33 grade point average on the state’s A-F report card system. The report card shows the school getting an F in mathematics achievement and mathematics growth, a C in social studies achievement, a D in reading achievement, and an A in reading growth and student attendance. “The C we made is tremendous,” said school principal Holly Davis, “[t]here is no English instruction in our school’s younger grades, and we gave them this test in English.” She said she had anticipated the low grade because it was the school’s first year as a state-funded charter school, and many students had difficulty with English. Eighth graders who graduate from the Tahlequah immersion school are fluent speakers of the language, and they usually go on to attend Sequoyah High School where classes are taught in both English and Cherokee. Other high schools in Oklahoma offer Cherokee and other Indian languages as second languages to count toward a foreign language requirement, and thousands of students, both indigenous and non-indigenous, enroll in classes. In North Carolina, the North Carolina House of Representatives has passed a state bill which mandates the requirement of constituent institutions of the University of North Carolina to recognize Cherokee as a language for which a student may satisfy a foreign language course requirement for degree completion. The bill was introduced by North Carolina Senators Jim Davis and Andrew Brock and was passed in the North Carolina Senate on May 13, 2013. (3) building of Western Carolina University programs to offer a more comprehensive language training curriculum. ^ "UNESCO Atlas of the World's Languages in danger". www.unesco.org. Retrieved 2017-12-17. ^ a b "Current Status of the Cherokee Language - DRAFT" (PDF). August 13, 2002. Retrieved April 9, 2014. ^ a b Cushman, Ellen (September 13, 2012). The Cherokee Syllabary: Writing the People's Perseverance. Chapter 8 - Peoplehood and Perseverance: The Cherokee Language, 1980-2010: University of Oklahoma Press. pp. 189–191. Retrieved June 2, 2014. ^ "Language". Cherokee Nation. Retrieved April 9, 2014. ^ "Welcome to the Cherokee Learning Center". Cherokee Nation. Retrieved April 9, 2014. ^ "Voting Accessibility". United States Election Assistance Commission. Retrieved June 4, 2014. ^ a b c "Cherokee Language Revitalization". Cherokee Preservation Foundation. 2014. Archived from the original on April 7, 2014. Retrieved April 9, 2014. ^ a b c d e f g h Kituwah Preservation & Education Program Powerpoint, by Renissa Walker (2012)'. 2012. Print. ^ "Kituwah Preservation & Education". Eastern Band of Cherokee. Retrieved April 9, 2014. ^ a b c d Walker, Renissa. Personal Interview. April 9, 2013. ^ "MS BASKETBALL: Braves use Cherokee language to win SMC championship". Cherokee One Feather. Retrieved June 5, 2014. ^ a b c d e f g h "Cherokee Immersion School Strives to Save Tribal Language". Youth on Race. Archived from the original on July 3, 2014. Retrieved June 5, 2014. ^ "Tribes draw knowledge from monolingual speakers". Cherokeephoenix.org. April 8, 2014. Retrieved April 9, 2014. ^ "Oklahoma Schools Push to Keep Native Languages Alive". Indian Country: Today Media Network.com. December 6, 2012. Retrieved June 7, 2014. ^ a b Mckie B.P., Scott (July 19, 2013). "State Bill: Cherokee language recognized by UNC system". Cherokee One Feather. Retrieved June 7, 2014. This page was last edited on 14 March 2019, at 07:24 (UTC).